Since European soccer has well-and-truly caught on in North America, now is the perfect time to start looking for other sports to import to our shores. While the obvious—and most-popular—contenders are rugby and cricket, perhaps we should think a little more outside the box and make a niche sport the next one to blow-up. And if this amusing infographic about the Great British Olympics created by Holidaycottages.co.uk is anything to go on, Britain will be a source of many of the strangest, um, strongest candidates. Using some of their suggestions and a few of our own, here are a handful of the world’s weirdest and most unique sports that might just be coming to a field or flatscreen TV near you. To say that black pudding is an acquired taste would be an understatement as this delicacy is a combination of pig’s blood, onion and oats all rolled up into one. Black pudding is beloved in Northern England, and it’s here in the charming village of Ramsbottom, Lancashire, near Manchester, where you will find the Black Pudding Throwing Championship. Each year, contestants chuck three bits of black pudding towards a pile of Yorkshire pudding (a specialty from the rival county) on a pedestal, with the person who knocks the most off being declared the winner. Tip: If you make a run to “Rammy” to scout out black pudding throwing for yourself, make a pitstop at the Eagle & Child as they serve great pub food alongside sweeping views of the surrounding hills. You’ll need both brains and brawn to excel at chess boxing as combatants alternate rounds of pummeling each other’s brains out with civilized sessions of chess. Fighters have to last six rounds of chess and five rounds of boxing to survive a chess boxing match— unless somebody gets knocked out or scores a checkmate. Sick of snorkeling in crystal-clear, warm Caribbean water? Think things would be way more interesting in murky, ice-cold water? 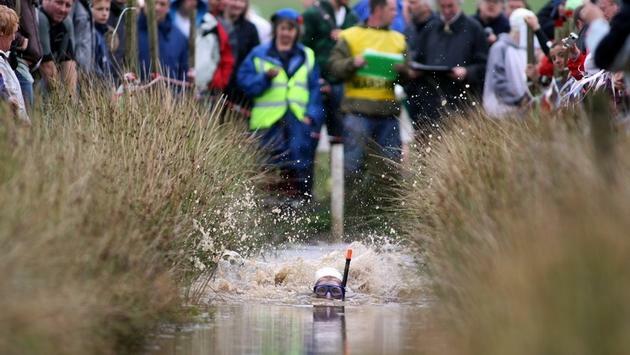 Well, then bog snorkeling is the sport for you. Suited up with a mask and fins, bog snorkelers swim two lengths of a 180-foot long bog without the use of standard swimming strokes. The best place to get introduced is the town of Llanwrtyd Wells in Wales, which holds an annual championship that attracts people from all over the world. Born from a legend of rural Finnish “stealing” women from neighboring villages, wife carrying is the ultimate test of a marriage. Taking place each July in the town of Sonkajarvi, Finland, the “husbands” compete to see who can carry a “wife” the fasted down an 800-foot-long track, which sees them wading through water and climbing several obstacles. Are you intrigued by skateboard tricks but concerned they’re a little too much work? May we present extreme sitting, or as it's known in its native Germany: sporthocking. Extreme sitters toss, spin and kick a bongo-shaped stool into the air before slamming it down on the ground and planting their posterior on it. We’re not making this up. Another bizarre British battle, toe wrestling is not for the faint of heart—or those who only want to play footsie. Toe wrestlers sit opposite each other with their digits locked together and their hands on the ground. Then after the whistle blows, they try to shove their opponent’s foot into a piece of wood set up next to the contestants. Naturally, when a point is scored, it’s called a “toe-down”.